Ebel is a brand that seems to get passed up by many WISes because it is perceived as more of a fashion brand than anything else. 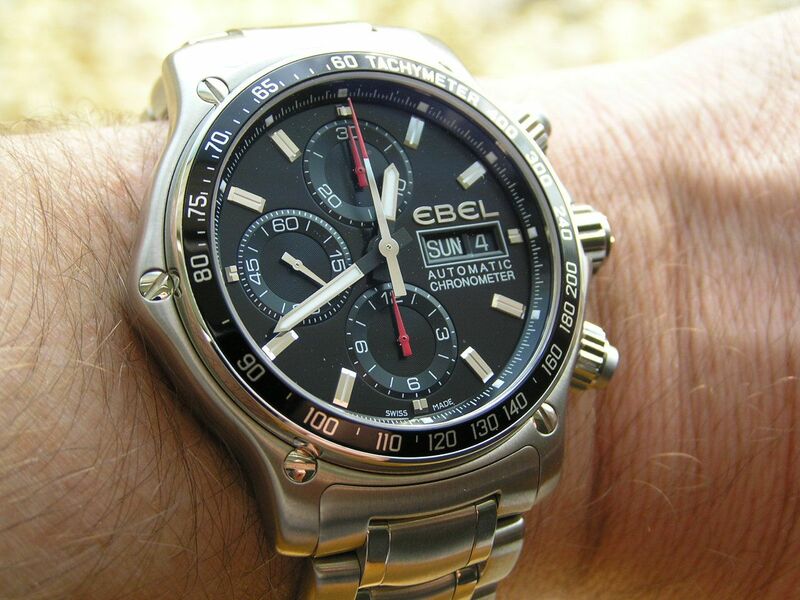 While this may be true in some regards, Ebel is capable of making some fine timepieces and the 1911 Discovery chronograph reviewed here is a great example of Ebel’s watchmaking expertise in a non-fashion style watch. Ebel is currently celebrating its 100th anniversary as a true Swiss watchmaker, the name being an acronym of the founder’s names of Eugene Blum and his wife, Alice Levy - Eugene Blum Et Levy. 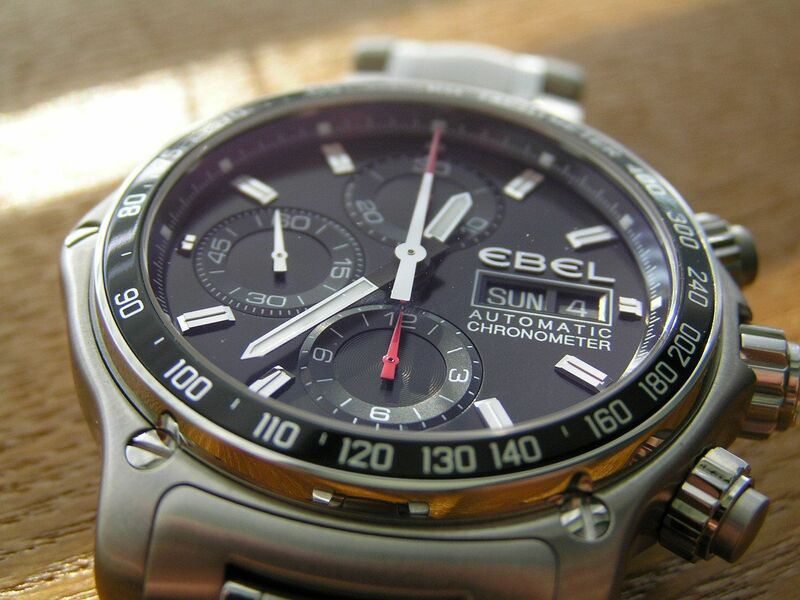 Ebel’s slogan is ‘the architects of time’ and refers to their dependence on style, overall design and engineering to achieve watches of extreme quality with fashionable looks while never losing sight of their Swiss origin. The 1911 line has been around since 1986. The current line-up of 1911 chronographs covers several different models, each with classic good looks and certain trademarks, like the real screws surrounding the bezel, that makes you realize the watch is an Ebel and no other brand. The 1911 chronograph reviewed here starts with a sizeable 43mm case of beautifully brushed-finish stainless steel, a case that exhibits all of its edges and corners having smooth radiused edges, no sharp corners here! The case is 14.2mm thick, with 22mm lugs. The case back is secured by eight fine screws and is brushed as nicely as the rest of the case. The case back protrudes out from the case somewhat, making the case sides lift off the wrist a bit. The case back is emblazoned with the 1911 logo. A note about the case, the left side of the case protrudes a bit because it bumps out at the 9 o’clock position (if measured from this bump out to the other side of the case, the case dimension is 44mm w/o crown, 49.2mm crown inclusive). This doesn’t bother me, but it does make this watch wear even larger. The crown is signed and screws down smoothly with four turns-to-lock. 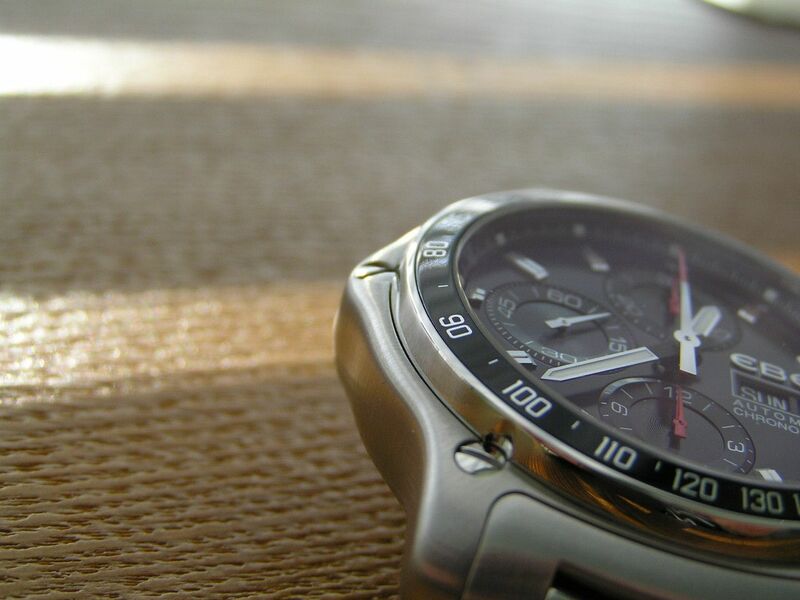 The chronograph pushers, while they look like they should be screw down, do not screw down. No biggie, but the faux aspect of this design seems to run counter to Ebel’s tradition of engineering and design excellence. 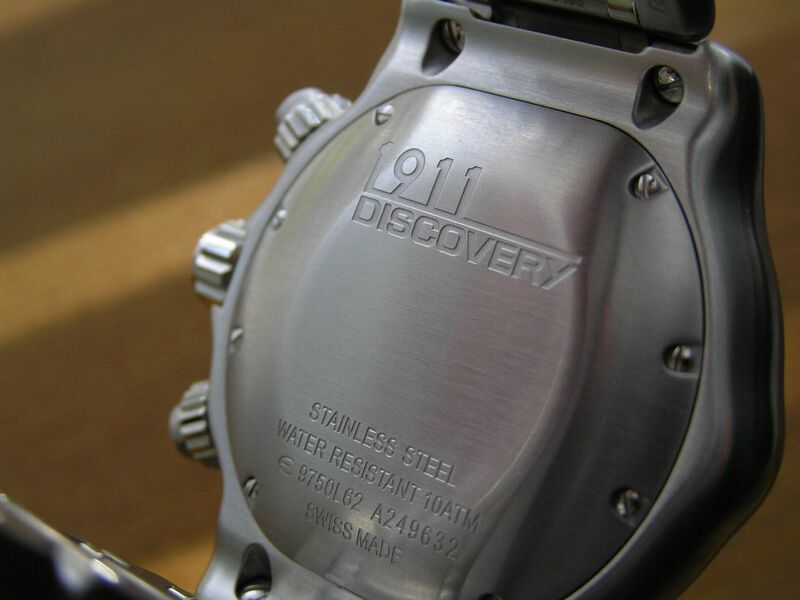 The 1911 chronograph is factory rated at 100 meters of water resistance. There are a total of 17 real screws on the case, surrounding the bezel, securing the case back and attaching the bracelet to the case. 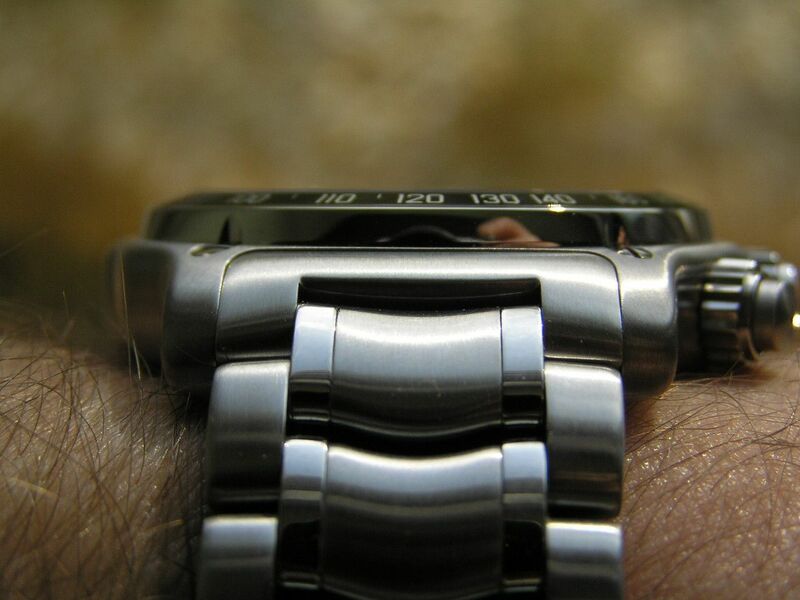 These screws give a real feeling of quality to the watch. A flat sapphire crystal with anti-reflective coating on both sides covers the dial and gives an incredibly clear view of the dial in all lighting conditions. This watch is very easy to read. 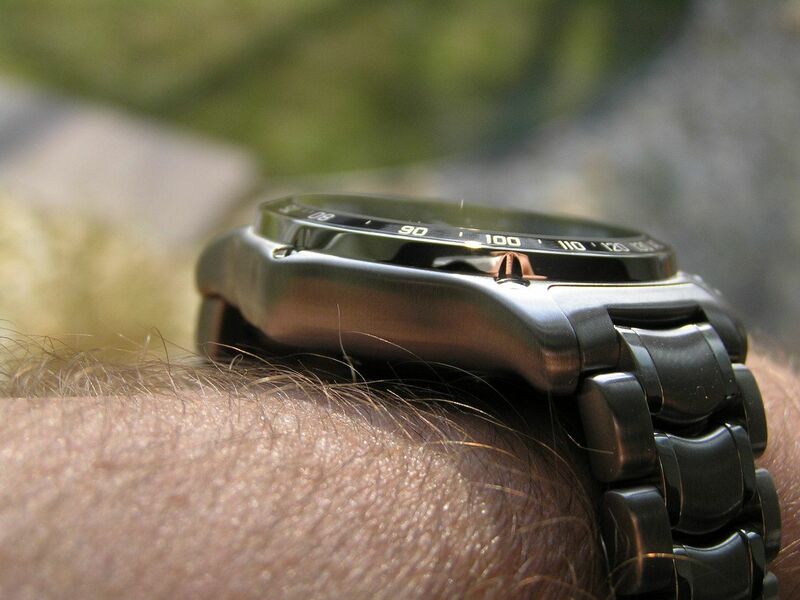 An aluminum bezel with black tachymeter insert surrounds the crystal. The dial is pure black with applied silver indices with small lume dots on the outside edge of the markers. 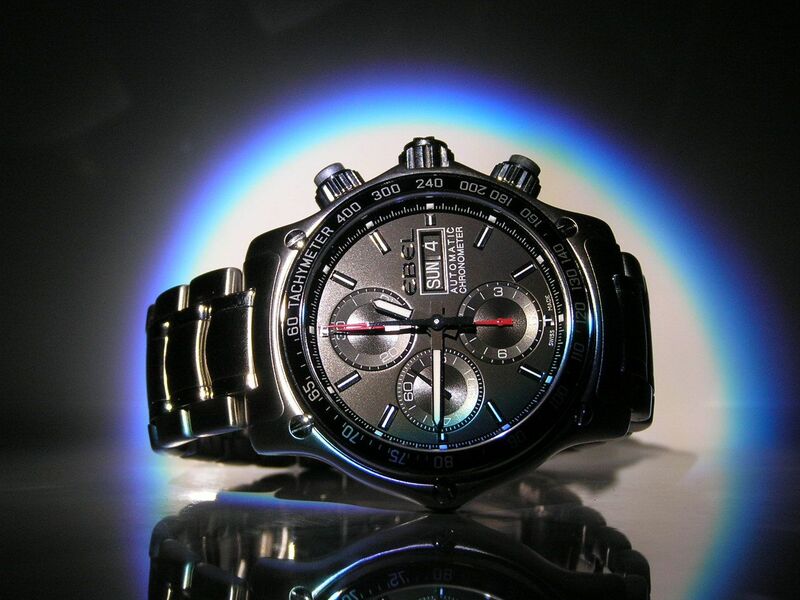 The hour and minute hands are silver with inset lume, the center chronograph second hand is silver with a red tip. The subdial set up is standard Valjoux 7750. 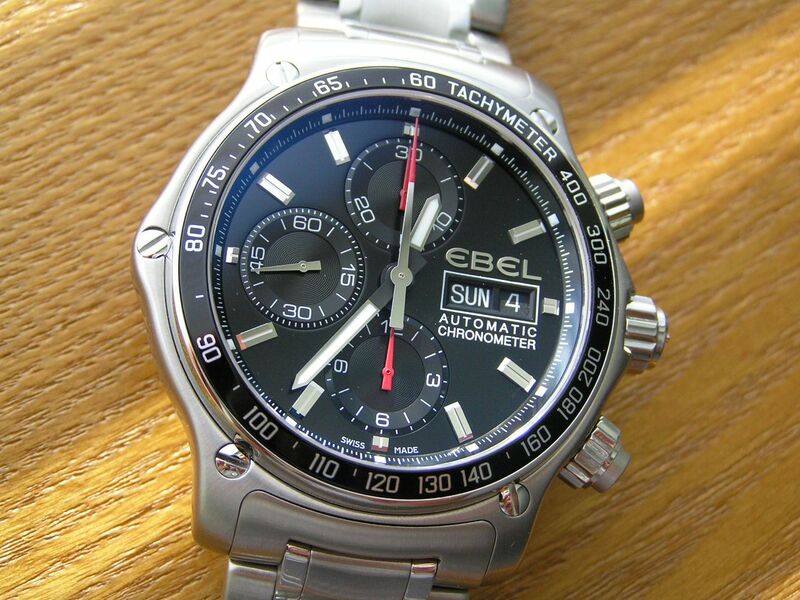 The subdial at 12 is the chronograph minute counter, the subdial at 6 is the 12-hour chronograph totalizer and the subdial at 9 is the main watch seconds hand. The subdials are fairly straightforward, slightly dished inwards and have white markers. The chronograph subdials have red hands, to go along with the red tip on the center chrono seconds hand, to more easily differentiate the chrono timing functions from the standard timekeeping of the watch. More watchmakers seem to be doing this with their chronographs and I think it’s a good idea. My recently acquired Seiko Flight Master automatic chronograph uses the same technique, except with yellow hands instead of red. 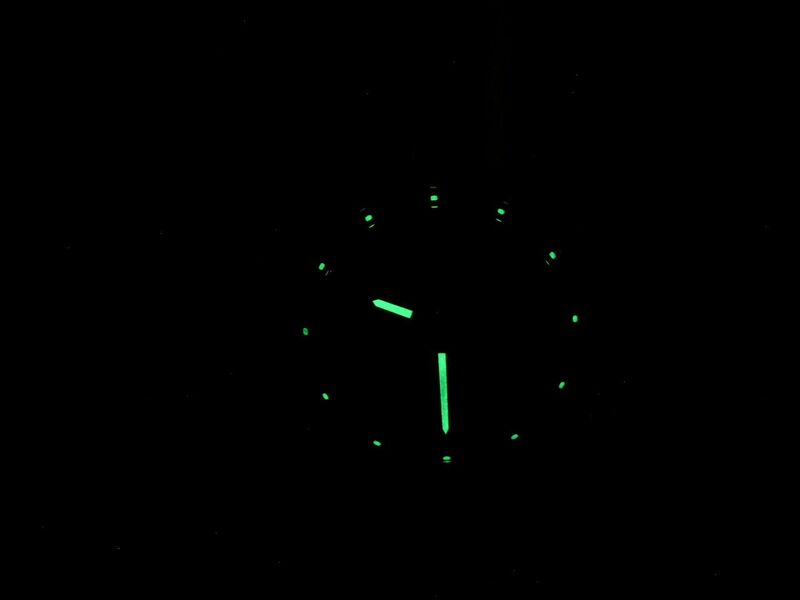 Lume quality is average, but rather minimal, as only the hour and minute hands and marker dots are luminous. A quickset day and date display is located at 3, with the wheels a proper white on black that compliment the dial perfectly. Minimal dial printing consists of the name ‘Ebel’, and ‘automatic chronometer.’ Overall, the dial layout, look and legibility are top notch on the 1911 chronograph. 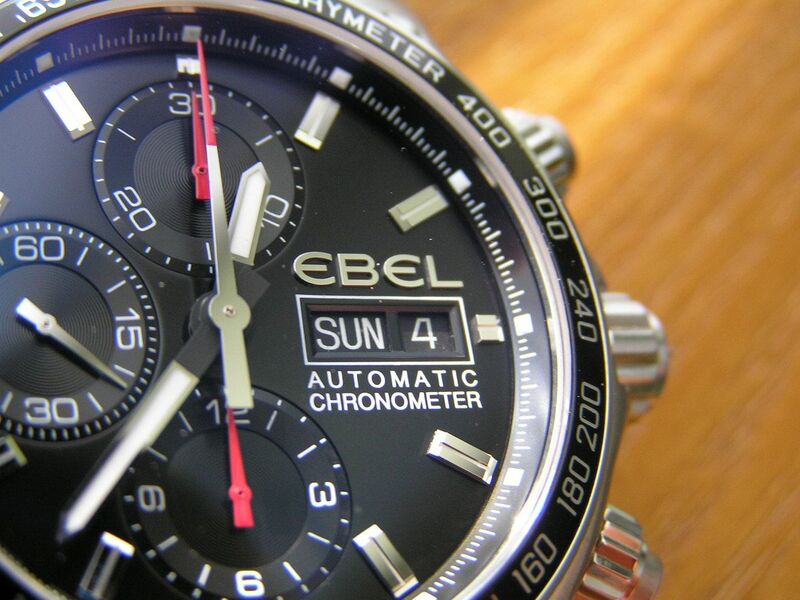 The markers tend to be a bit too shiny at times along with the Ebel name, but it’s a minor inconvenience to an overall superb dial. And speaking of chronometer, yes, the movement in the 1911 chronograph is a top of the line Valjoux 7750 COSC rated movement (Ebel Caliber 750). This is especially appealing given the price that these watches can be purchased for and adds a lot to the overall value equation of this model. The COSC 7750 runs perfectly, winds and hacks with precision and turned in a fine 54 hour power reserve during my testing. Accuracy meets COSC standards, consistently running at +2/24 hours under my tutelage. The chronograph starts, stops and resets crisply and the pushers have a nice, firm action about them. 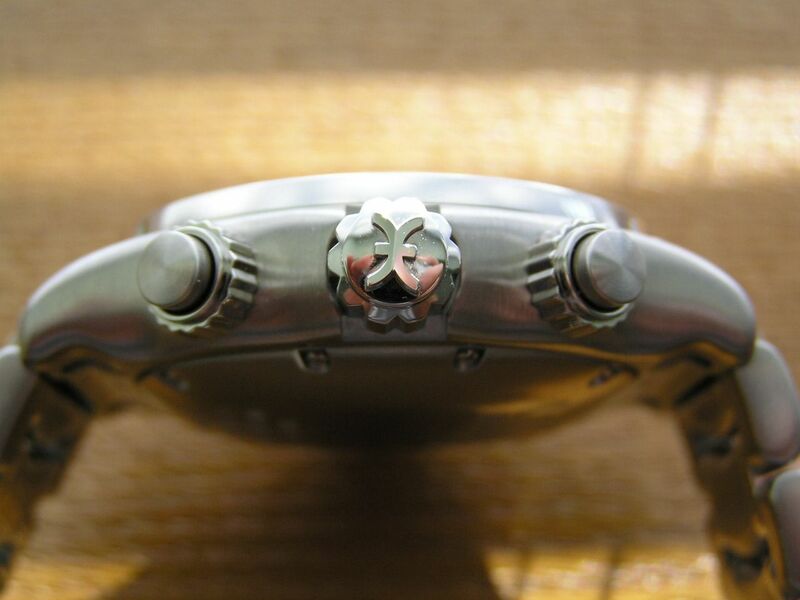 The only odd thing I have noticed with this watch is the way the hands set through the crown. There is no resistance at all, the slightest turn of the crown moves the hands. I don’t know if this is a characteristic of the COSC 7750 because I don’t own any other COSC 7750s or just the way the watch is put together. It is a bit annoying at first, I would prefer some resistance because it makes hack setting easier, but that’s really the only quibble I have with the movement. 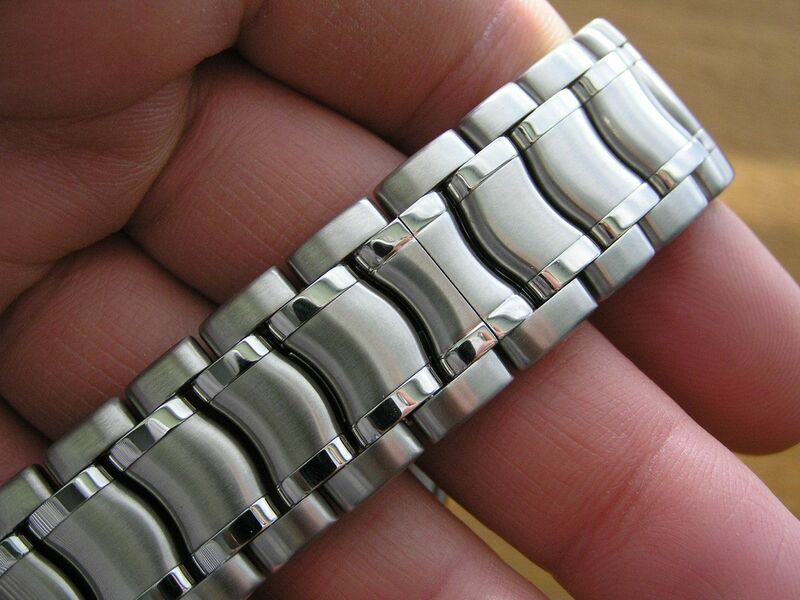 The bracelet is solid link stainless steel with a continuous link design without any exterior clasp or even a pushbutton release. You have to yank on the clasp to open it up, very uncharacteristic of a company that prides itself on design and engineering and very inelegant in a fine Swiss timepiece. Major demerits here from me, almost to the point that I did not even purchase this watch because of this fact. It annoys me that much. Even more puzzling is that the machined butterfly clasp is nicely polished and even has perlage on the inside of its small flat surfaces. 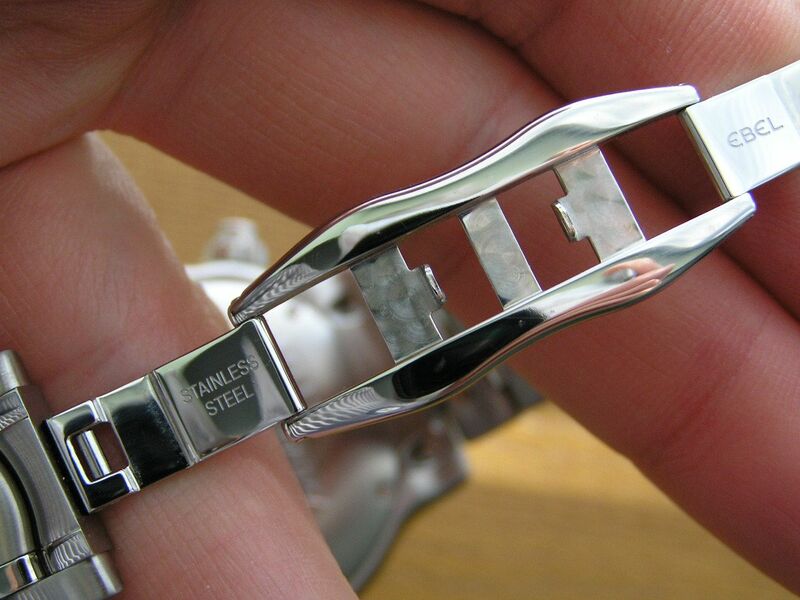 So if Ebel takes the time to add a tiny detail like this on the clasp, why can’t they add a pushbutton release? Just doesn’t make sense to me. 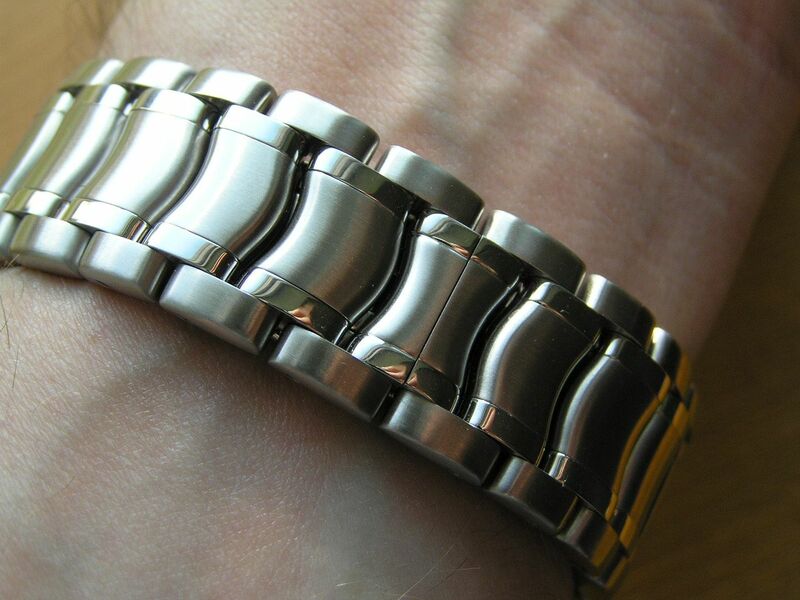 The bracelet measures 22mm at the lugs and tapers to 19.7mm at the center of the clasp. The finish is finely brushed with two polished middle links and matches perfectly the finish on the case. 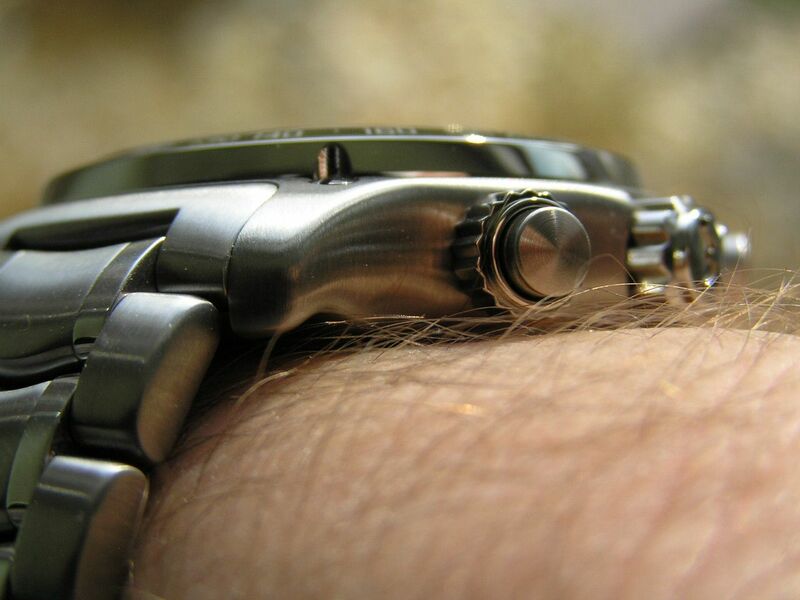 The attachment of the bracelet to the case is a proprietary design and is secured with screws. All well and good, the design works well, but precludes using any aftermarket straps. 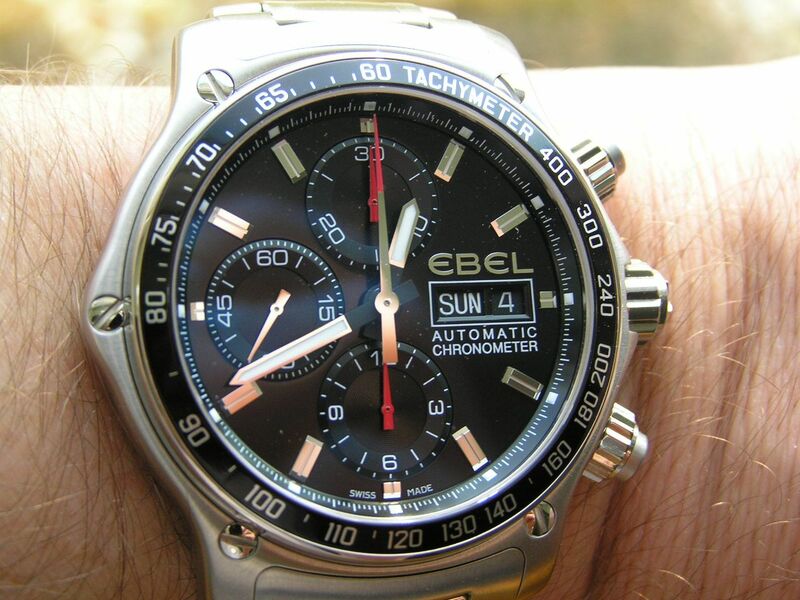 You have to purchase a pricey Ebel leather strap if you want to go from stainless to leather. Despite its fairly largish dimensions, the 1911 chronograph wears well and feels good on the wrist. This is not a light watch, it has a good heft to it and a definite presence on the wrist. Presentation is superb, a tan colored genuine leather covered box with a great feel and that real leather smell. Kudos to Ebel for not skimping here. 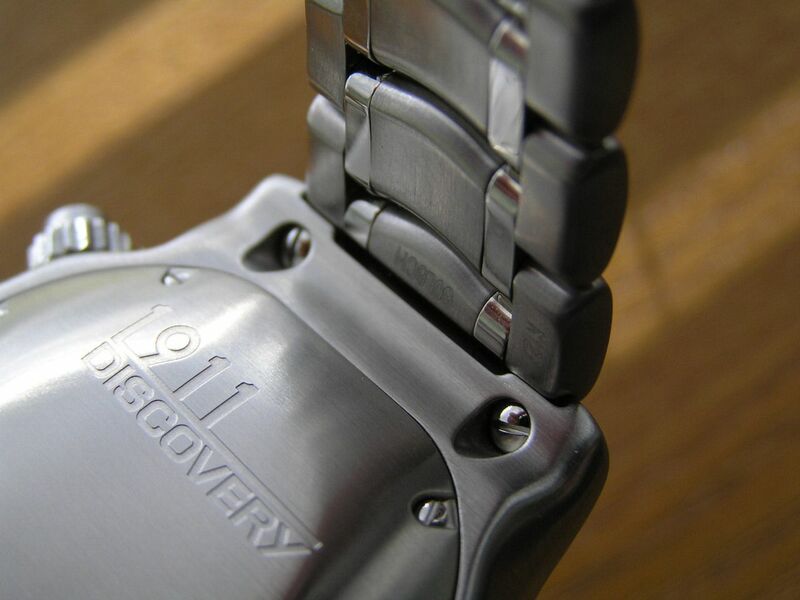 The 1911 Discovery chronograph represents a true Swiss-designed and crafted watch from a watchmaker that takes pride in its job to deliver quality and style. 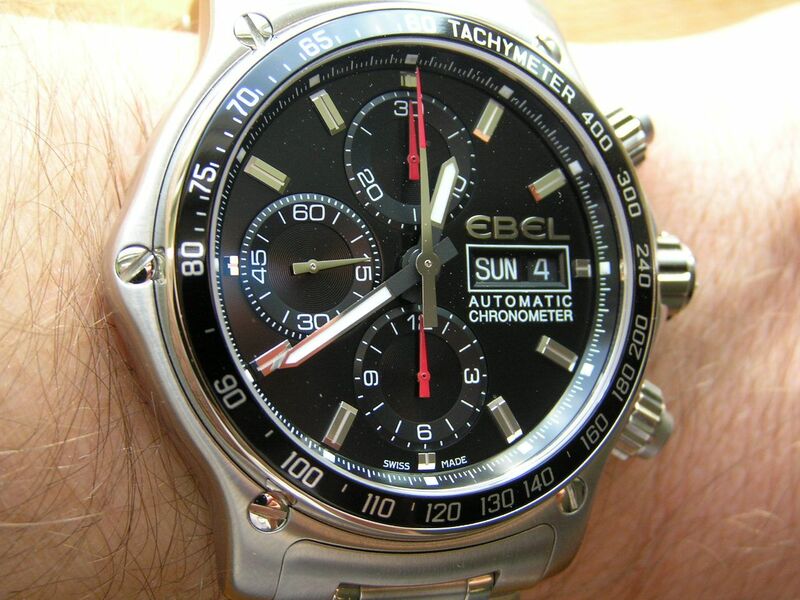 I would add value, as the price of admission for a COSC chronograph is quite affordable.